Interplanetary Colonization represents one of the largest technological and logistical challenges on the horizon for manned spaceflight. 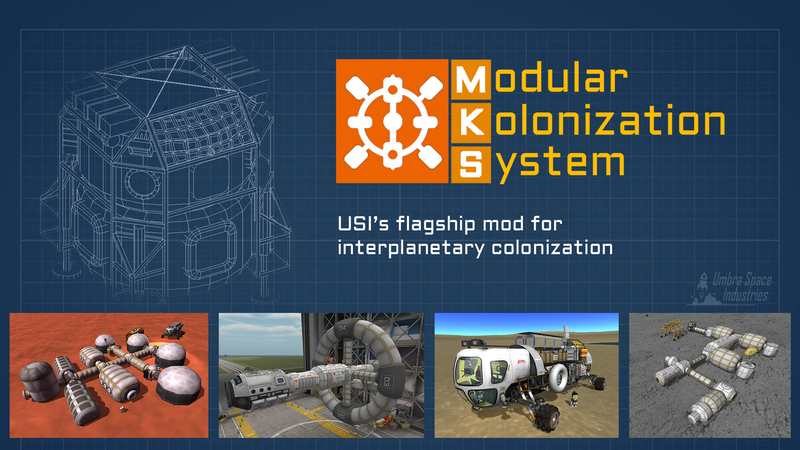 USI's Modular Kolonization System (MKS) provides a huge array of new gameplay systems and supporting parts to support the experience of designing, building, and maintaining interplanetary colonies in Kerbal Space Progam. For over three years, MKS has been the definitive Colonization mod for KSP, with continued refinement of the parts and core systems (including the resource system now integrated in the stock game) based on extensive community feedback and continued development and design. MKS is not a parts pack. It is a gameplay mod that adds a massive amount of end-game content for KSP, and can serve as the perfect capstone for your career save. It can be soul crushingly hard, and as unforgiving as gravity. But it can also be an incredibly rewarding gameplay experience, bringing back that sense of wonder and accomplishment that many of us remember from our first Mun landing. If you want a parts pack where your idea of a colony is landing a single ship and call it a day, this is probably not the mod for you. If you want something that transforms your gameplay, and gives you unapologetically difficult goals where you have to juggle planning, logistics, and the harsh constraints imposed by space, then you will likely get as much enjoyment playing MKS as I have received building and designing it. A huge assortment of parts suitable for surface and orbital bases and stations, drawing inspiration from real-world parts and concepts from Bigelow, NASA, and others. A clear progression of parts, from simple outposts and mobile bases to larger manufacturing complexes and permanent colonies. Extended ISRU operations with more resources and more complex harvesting, refining, manufacturing chains, and new mechanics. Customizable and field-configurable converters and harvesters to allow post-launch customization of your colony. Parts and tools for contructing bases including weldable ports, magnetic couplers, and heavy construction equipment via the bundled Konstruction mod. Comprehensive and seamless integration with USI Life Support, including life support, habitation, and homesickness. 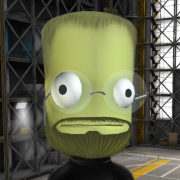 Kolony rewards, providing ever increasing efficiencies as well as tangible bonuses in career mode, as your Kerbals gain experience colonizing other planets and moons. The ability to support permanent colonies as well as ark-ships as your Kerbals expand their knowledge and become more experienced with off-world colonies. I hear MKS is really complicated - is that true? MKS has significant depth and breadth, but provided you don't try to do everything at once, you will find the learning curve can be pretty reasonable. Start with life support, and don't get fixated on trying to build everything at once. The patterns learned with a small base quickly scale for larger ones. Thanks to @dboi88, MKS enjoys full KSPedia documentation. There's also an excellent community maintained wiki available here. MKS Documentation even has its own development thread here. I can't seem to fit a 100% self sufficient base in a single launch - what am I doing wrong? Building a self sufficient colony is hard. Like... REALLY hard. It's going to take a lot of launches and a lot of work. The idea of MKS is that it is not about plunking down a base and being done. Rather, it's the journey to get to that point that is the fun bit. So yeah... you are going to need a few more rockets. I can't find a place to create my base that has all of the resources! Good. Now you get to enjoy some of the challenges that result from resource constraints. Do you ship things in? Do you set up multiple bases? Or use low-efficiency harvesting to get trace materials and salvage the rest from scrapped components? I feel overwhelmed... I try to make a base, and it seems I just need so many different parts! Start small. Start with just a habitation module or two and ship in supplies. Then add some agroponics and ship in fertilizer. Once you get those down pat, you are ready for more complex systems. I am still lost - where can I get help? Ask in this thread. A lot of the folks here have been using MKS in their games for years, and are a pretty friendly lot. This looks amazing, and I didn't have any plans for my weekend anyway - where do I get this stuff? Configuration files and code are licensed under the GPL v3 license (see attached). This mod redistributes Firespitter, which is covered under its own license. This mod redistributes ModuleManager, which is covered under its own license. This mod redistributes Ground Construction, which is covered under its own license. Perfectly bad timing for the thread to vanish. Will spread the word. Btw, not able to check at the moment, but was constellation updated as well? I commented on Local Logistics in the other thread, so I wanted to say 'yay!' again here for that. Also loving the KIS storage additions. I can't seem to deploy any inflatable ranger modules. I'm in a career mode, on the launchpad with a duna logistics center, 16000 material kits and an engineer. Right clicking on the had or agriculture module doesn't give a deploy option. If the engineer goes eva she has a deploy option, but unfortunately she left the 8000 material kits required in her other trousers. Show a pic of the vessel please. Heh, this thread will hit 1000 in no time. Just posting so it shows a start in my list. @tomf - how much EC? Because I was unable to repro your issue. After upgrading last night, I noticed that some of my drill modules reverted to dirt and/or stopped drilling. I suspect it was just an upgrade artifact and not worth bothering with at this point, but if I see it happening again, I'll see about creating an issue. Also, it seems that local resource management did not want me to off-load my machinery delivery. The material kits off-loaded just fine, but I had to hook-up a pipe to off-load the machinery. I'll try to take some screen-shots if it happens again. The current iteration of the vessel has 17026 EC. Another more minor issue is that when I launch the duna modules legs are always extended, and if I don't hold it above the ground somehow it goes pinging off into the air when the physics kicks in. I feel like there used to be a special UI in-game that would show you Kolony production figures - consumption and production of all the various resources used in MKS. I haven't been able to find it in my latest save, however. Is that something that still exists and I'm just missing it? In-game you can see everything currently stored in the planetary resources to get an Idea what you are producing a lot of. Or you can open up your resources tab for the current base and look at what you are producing vs consuming(if there is a - in front of he number on the right, you are a net producer, if there is no - in front of the consumption and it is not (0.0) then you are a net consumer. Gotcha. I'm trying to set up a plan for a base, and I can see ratios provided in the wiki, but what I feel like I'm missing is the actual values produced by each of my actual parts, after multipliers. I can see that something is negative or positive, but the values on a per-second basis are so low as to be very difficult to discern how positive or negative it is. I have a base I'm partway through building, and looking to expand into the later-tier resource chains - I think all my numbers are positive, but my Gypsum is being changed to Fertilizer faster than it's being mined. I suppose I could just keep throwing the pieces out there and add drills and farms etc. until it's all positive, but that seems wasteful, and hard to plan around for an even bigger future base. I guess I was hoping there was an easy, Anno-style "1 drill provides 2 resource X, which feeds 2 converter Y, which provides enough resource Z for 4 kerbals" set of ratios. For everything else, you can look at your % for that production step(also given in the right-click menu) and multiply it by the numbers in the config files (the config files provide per-second numbers, and I'll try to add those to the Wiki like I did for EC on supplies parts, next time I update it, probably this weekend). I am re-inserting myself into planetary colonization, I got the an Ore Drill site working - Drilling, cooling and pushing to the planetary warehouse. I have a pilot and an engineer posted at the site with supplies for a couple of months. I understand that they might get frigidity without proper habitation, what can I land and connect to maintain and what is the frequency of crew rotation? The Ore Processing [located somewhere else on the planet] was a chore, mainly because I am not that good of a Rocketeer, but I did build fairly decent rig that I assembled in orbit above the Mun and landed. I then landed another logistics structure with an inflatable for ore and when I connected the two structures, the ore was flowing and I was able to start making LFO, etc. When I went to hire a new crew for this mission, the new kerbal classes were presented and I was lucky to have an engineer left in the pool. The MKS documentation I think says that I need a pilot? Is that all that I need for logistics? What do I have to have in place to be able drop supply crafts and not have to plug them in to be utilized? I think, since I now have the means to make fuel, i wanted to get the 'supplies' going... do you have some advice? I ask the obvious question, as there used to be a flowchart to follow, but the link I had no longer show the chart. For hab, the beauty is that it works even if not connected (provided there's a kerbal in it). So land some hab modules nearby and move in a kerbal, That's going to drive crew rotation frequency. The pilot is only needed to pull, not push. So on your mine, leave the engineer in the hab with your drill nearby. Put your pilot at the processor so they can pull resources. Supply crates can be used by anyone within 150m, no pilot required. After I had everything else set up and processing, I did add some of those ranger green-houses to my bases(Using Cultivate to turn substrate+water into supplies), but those are more for putting supplies in the planetary warehouse against a future emergency than they are for life support. I'm having a similar issue. My minidrill and crusher don't want to change what they concert/drill. Have the specialized parts in a connected workshop and materialkits in a inflatable storage also connected. Used KIS to connect some MSI trusses to the dougnut connector with a anchor ball. Tried all this with Bill. Have plenty of EC as well. I can sent you a pic if you want. I really enjoy your mods! Love them! @RoverDude & @terwin thanks for the posts, I will attempt to take what you passed along and see what I can do. I tried to do the supplies by just 'plopping' them, and then timewarped to see what would happen and I didn't see the levels change? I think this was about 2 updates ago? Refinery output efficiency has been buffed by 500%. Applies to all refineries, sifters, crushers, and smelters. Does that include the Nuclear Fuel Plant? I may have encountered a bug somewhere in the now constellation update. I am docking two ships in Kerbin LKO one with kerbals the other a drone ship. Both ships have sufficient supplies and at the moment of dock all supplies in both ships goes zero, and both kerbals become tourist. I reverted to the older version of usi-ls and tried to dock again with similar results so the bug is somewhere else. I am running a heavily modded game, so very likely this is caused by another mod, and will run another test and provide logs on a stock + MKS version tomorrow. Has anyone else run in to this with the update?